Best Casino is home to a large community of happy online casino players. The online casino was launched soon after Best Poker, its sister site in 2005. Best Casino aims to be the best in the industry in terms of contests, promotions, and bonuses. The owner of Best Casino is Bestbet Limited, a company based in Malta. The company has its offices at BestBet Limited, Level 1, Tower Business Center, Swatar, Birkirkara BKR 4013, Malta. The online casino operates under a license granted by the Lotteries and Gambling Authority (LGA) of Malta. This assures that Best Casino is secure, well-regulated, and highly trustworthy. The Best Casino website features a fun, animated and user-friendly layout with numerous categories and filters. This ensures you can navigate the site with ease. Situated at the top of the homepage are three main tabs consisting of a live chat tab, bonuses tab, and a sign-up tab. You will also find the login tab at the top right hand corner. Scrolling down, you will notice a section dedicated to providing all the different games featured at Best Casino. You can filter the game collection by the Most Popular games, Jackpot games, Slot games, Table Games, Video poker games and live casino games. If you already know the name of the game you are looking for, you can use the search bar. Selecting the different game filters will take you further down the page. There you will find a short video clip that introduces you to each of the featured games. This is quite a unique feature that other online casinos don’t often include on their websites. Located at the bottom of the homepage, you will see several other important links including : the casino’s affiliate program, terms, and conditions, about us, anti-spam policy and responsible gaming. The Affiliate page will give you a short introduction to their affiliate program, where you can also sign-up. These include Best Casino, Best Bet, Best Bingo and Best Poker. By clicking on the terms and conditions of the casino, you will find a small pop-up box that will provide all the terms and conditions of the casino. Should you have any unanswered questions, you can also use the message box, located at the bottom right-hand corner. However, if the casino is online you can also utilize their live chat facility to get your question answered immediately. If you need any further contact information you can find this within The About Us link. Lastly, Best Casino’s Anti-spam policy and responsible gaming links provide useful information with important links. Best Casino welcomes players in three steps. In order for players to receive their generous welcome bonus, they must first register a real play account and make a first deposit. As soon as players register, they will receive 20 free spins on Net Entertainment’s popular Starburst slot. 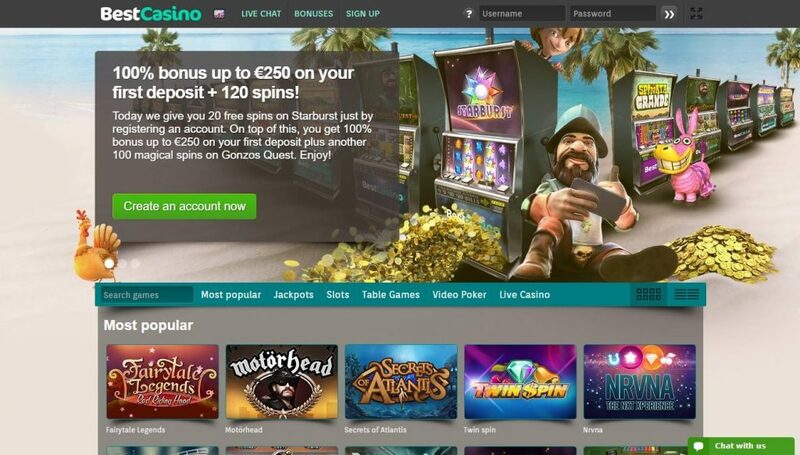 Following their first deposit, they will receive a 100% cash match bonus of up to €250, absolutely free. In addition, they will receive 100 free spins on NetEnt’s Gonzo’s Quest slot. The above-mentioned bonus offer is associated with a wagering requirement of x35 players’ bonus plus free spins winnings. Best Casino does not offer this bonus to players from Poland, Czech Republic, UK, Russia, and Romania. Best Casino features all of Net Entertainment games, including their popular progressive slots like Arabian Nights and Mega Fortune. You will also be able to enjoy other NetEnt slots including: Boom Brothers, Muse Wild Inspiration, Starburst, Aliens, Neon Staxx and more. The best table games can be found in the casino’s virtual collection. These include multiple variants of Blackjack, Baccarat, as well as Roulette, Stud Poker, Keno, Red Dog, Caribbean Stud Poker, Let It Ride and more. Best Casino’s video poker collection is comprised of three main variants and include All American, Joker Wild and Deuces Wild. Although this might be a bit limited, every game can be played with up to 100 different hands. This means you can decide your own level of variance. Best Casino also features the entire suite of Net Entertainment live dealer games. These live dealer games are available to all players. The Live Casino section also provides round-the-clock access to Live Roulette and Live Blackjack. There is always a spot available at the tables and features a built in chat function. The mobile platform at Best Casino is available directly through the website and works seamlessly. This ensures you can switch between devices without experiencing any hiccups or delays. Best Casino mobile does not require any additional downloads, so you can play instantly on their website. Established in 2008, Best Casino has yet to receive an award for their continued efforts in providing the best gaming experience online. However, using the best software provider, featuring some of the best bonuses and utilizing a fantastic website layout, it won’t be long before this magnificent casino is nominated for an award. Due to strict regulations, Best Casino are not be able to accept any registrations from players who reside in Costa Rica, Belgium, United States, Turkey, Spain, Netherlands, Malta, Israel, Hong Kong, Gibraltar, and France. The support system at Best Casino is highly rated. Best Casino offers you many ways to get in touch with them, including a live chat service. Alternatively, you can send an email to support@bestcasino.com. Best Casino aims to respond to queries at the earliest possible convenience. Best Casino has a good list of advantages that make them a compelling choice. Firstly, Best Casino features the full arsenal of Net Entertainment slot games. This including their legendary progressive games. The casino software functions completely on instant-play, so there’s no need to download any additional software to enjoy your favorite games. Best Casino also features a live chat facility to assist you with any query or request you might have. Lastly, all the information sent to the casino is safe and secure, as they use the latest SSL encryption technology. Best Casino is also tested on a regular basis and is proven fair by iTech Labs. There are however a few disadvantages that must be mentioned about Best Casino. The casino software is not available in the US, Hong Kong, France, Spain. The casino also has a limited selection of video poker games. Best Casino customer care does not include telephone support. Therefore you will need to wait for them to answer your email, or alternatively wait for them to be available on live chat. Lastly, the live chat facility is not available 24/7. Best Casino is one of the most exciting and trustworthy online casino brands for players looking for the ultimate NetEnt gambling experience. Getting started at this licensed and well-regulated casino is very simple. All you need to do is register a real play account and make a deposit using approved methods. These include: Neteller, MasterCard, Visa, Skrill Moneybookers, Trustly, and Bank Wire. Best Casino places huge priority on customer satisfaction, responsible gambling, and underage gambling prevention. Therefore they will not accept bets from those under 18 years of age. Best Casino is a must for anyone who enjoys Net Entertainment slots, as they feature every game that NetEnt has released online.